At Cracked Nut, sisters Nikki and Kelda have put a lot of care into creating a natural food market and café serving superlative soup, sandwiches, salad and scones, along with excellent tea and coffee. In addition to a gorgeous selection of pastries, there are breakfast options to rouse the sleepiest heads, including Porridge with a choice of toppings, melt-in-your-mouth French Toast, Homemade Granola and a proper Old School Bacon Sambo. At lunchtime, there are fresh deli sandwiches, the homemade Soup of the Day, and a selection of stunning salads. If you're working nearby and in a hurry, you can pre-order your Cracked Nut lunch for collection - just give them a bell. Don't forget the coffees and teas - every coffee that Cracked Nut serve is a double-shot of their award-winning Espresso Italia dark roast blend of 100% Arabica beans. And Cracked Nut support another Irish family business in proudly choosing McCabe's as their coffee supplier. Cracked Nut are available for both office and private catering, providing a large range of delicious handmade breakfasts, lunches, canapés, fruit, charcuterie and dessert platters. Call or email to find out more. 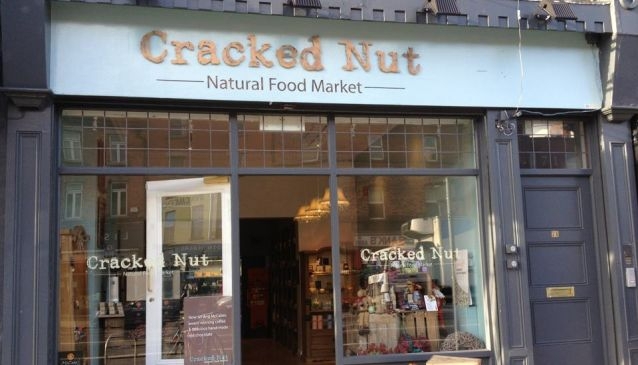 Cracked Nut is a warm, cosy space with a seating area, shelves stocked with tempting goodies, and a beautiful selection of natural products. Whether you choose to eat something then and there (resist if you can!) or take it away, stop in and you'll find lovely people serving lovely food.